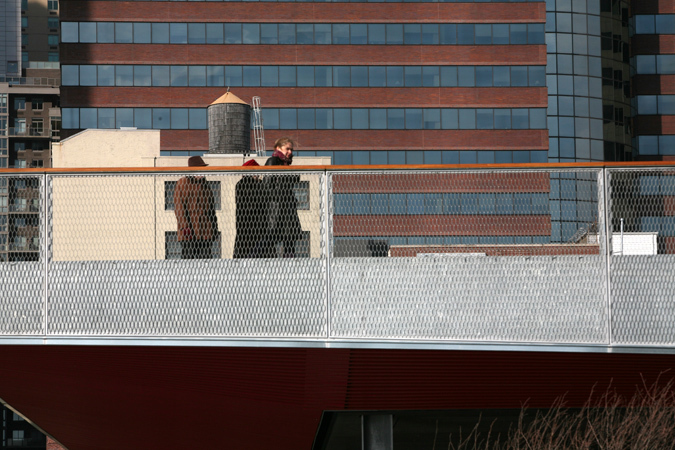 Before all eyes and ears were focused on the mayor’s announcement about Cornell and their EDC project upriver, AN was downtown for a much quieter opening of yet another EDC project. 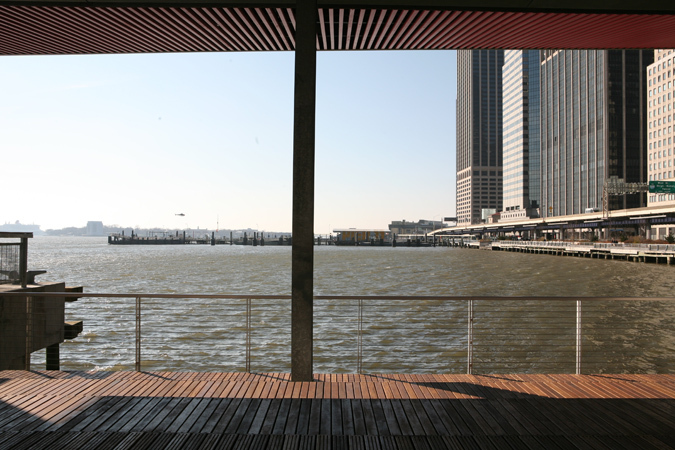 Without fanfare, the SHoP-designed Pier 15 opened to the public today. 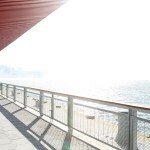 With the exception of another photographer and a family visiting from Spain, we were the only ones at the pier when the security guard unhooked the chain. 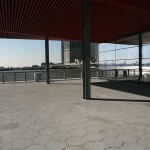 Three arched lawns grace the pier's second level. 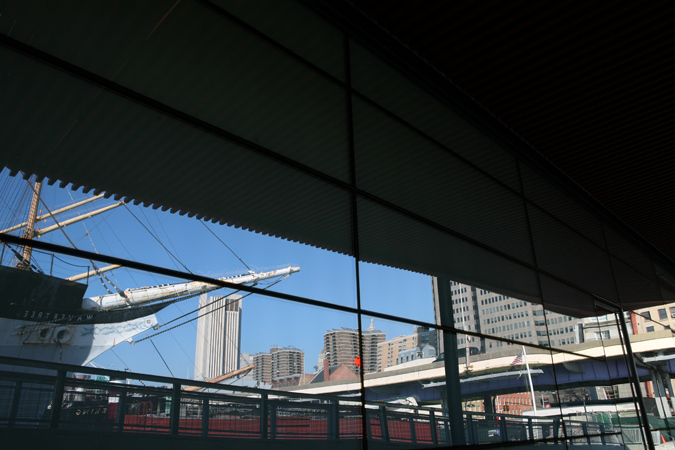 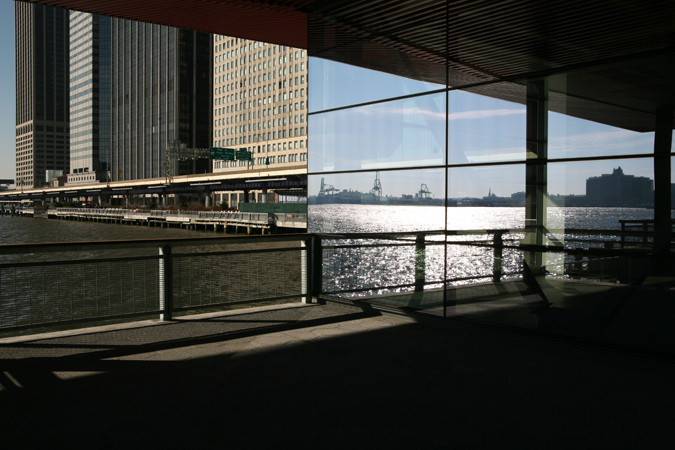 Across from Maiden Lane, the new pier is an exercise in restraint with two reflective glass pavilions supporting the top half of a bi-level pier. 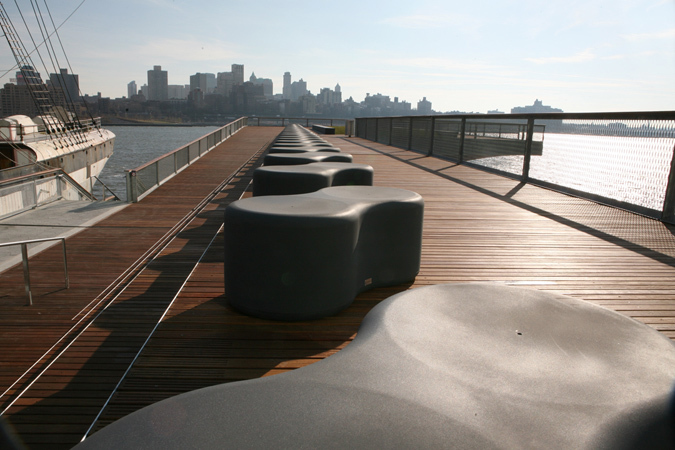 Once common in the Victorian era, bi-level piers are rare today. 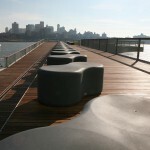 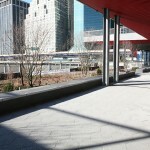 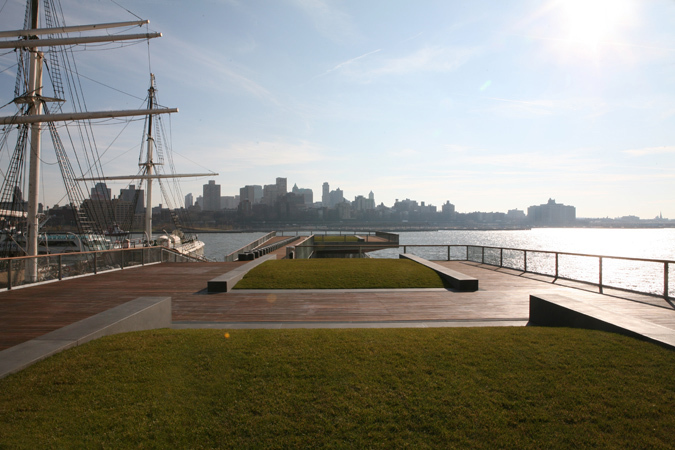 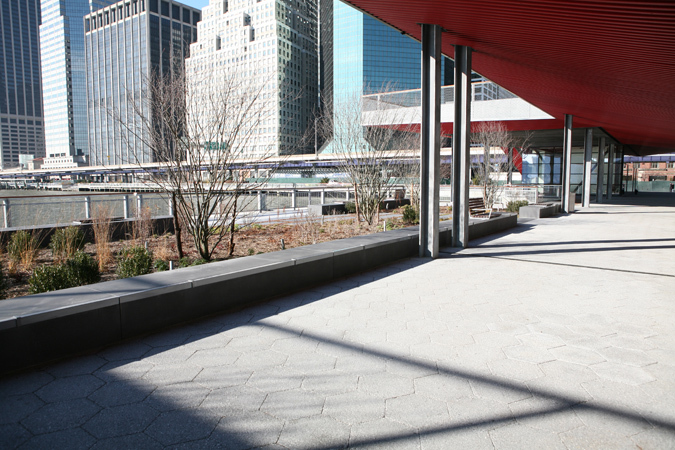 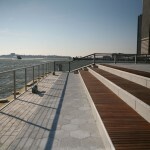 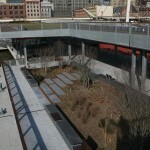 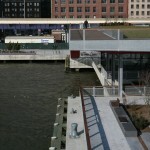 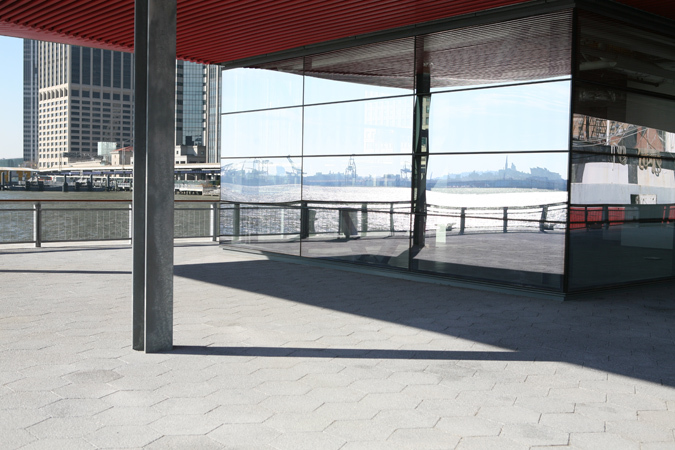 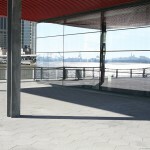 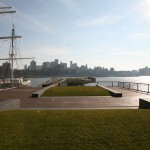 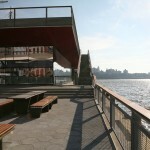 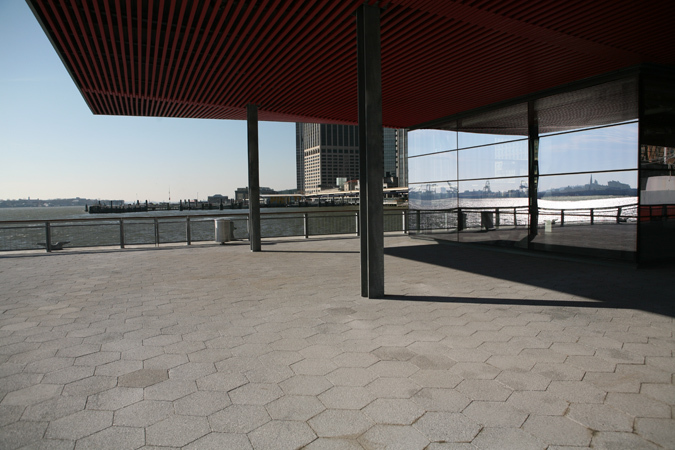 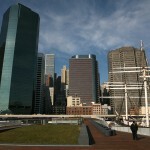 The upper-level of this pier sports three small rolling lawns, slightly arched in profile, that overlook the East River. 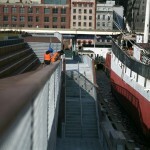 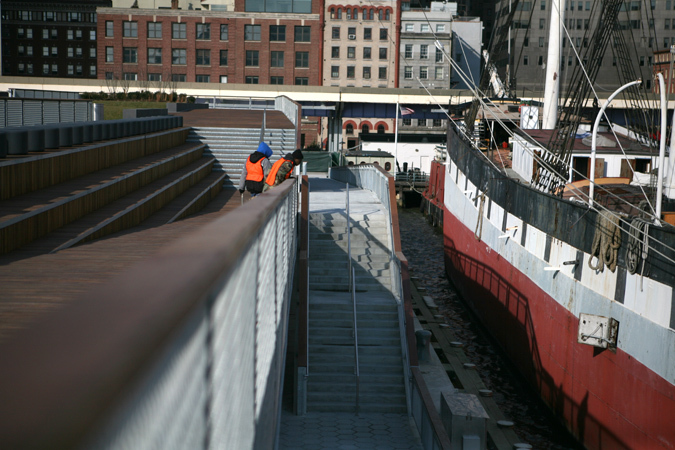 A long ramp leading to the upper level suggests a gangplank. 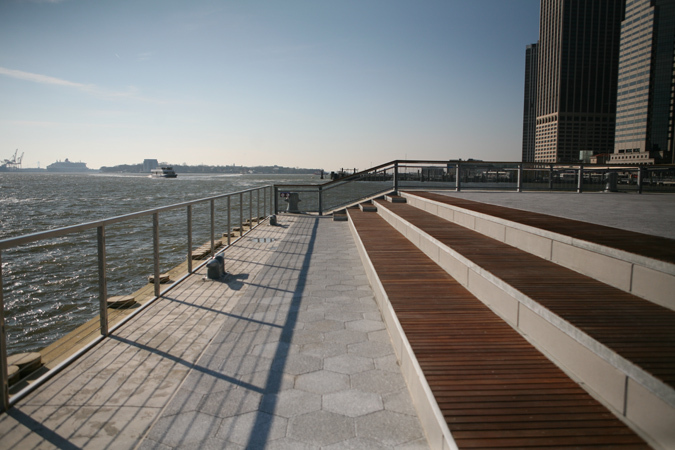 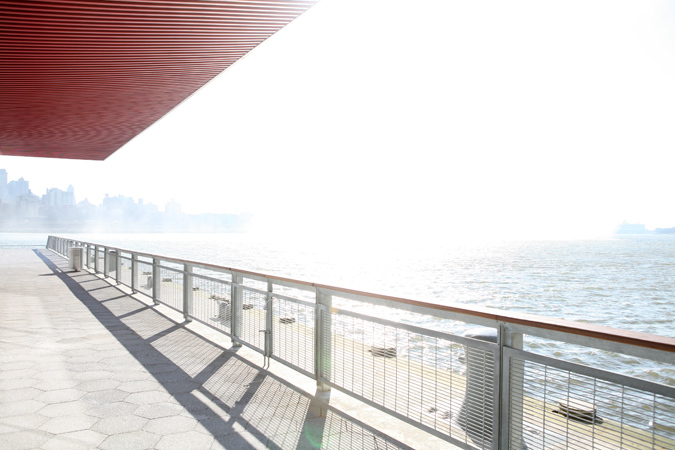 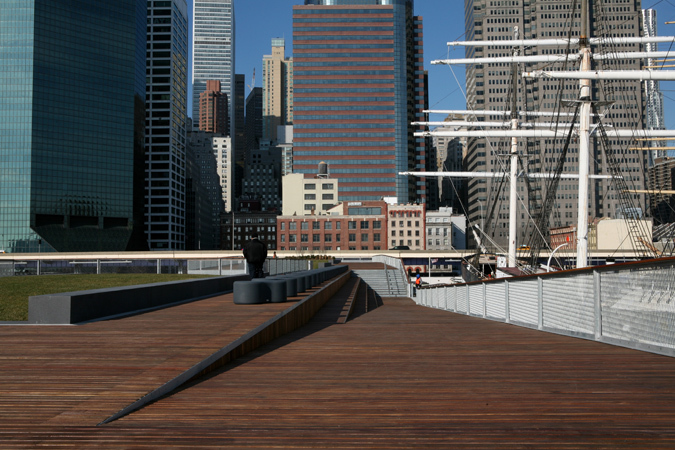 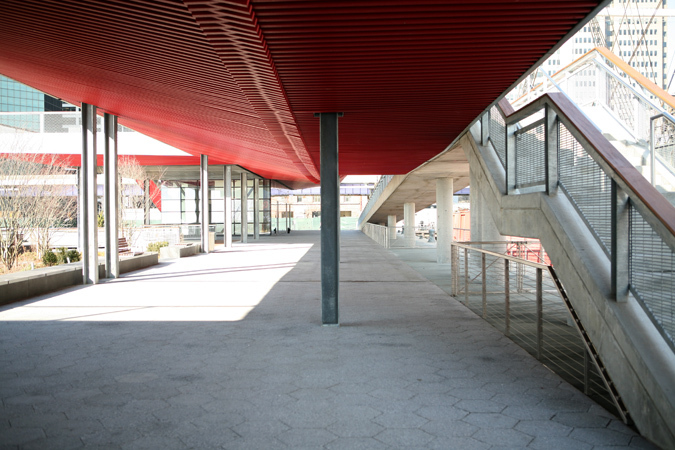 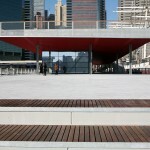 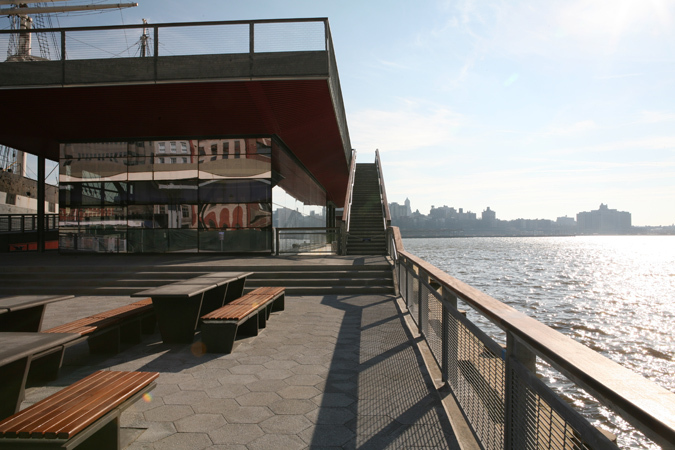 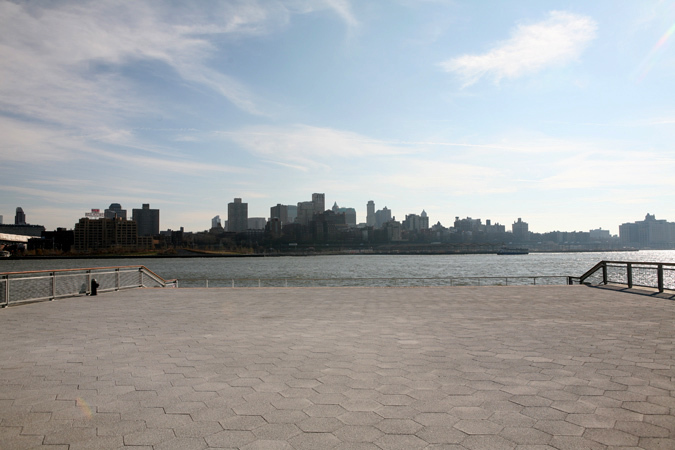 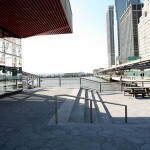 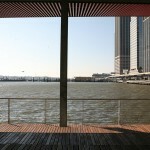 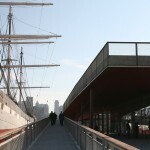 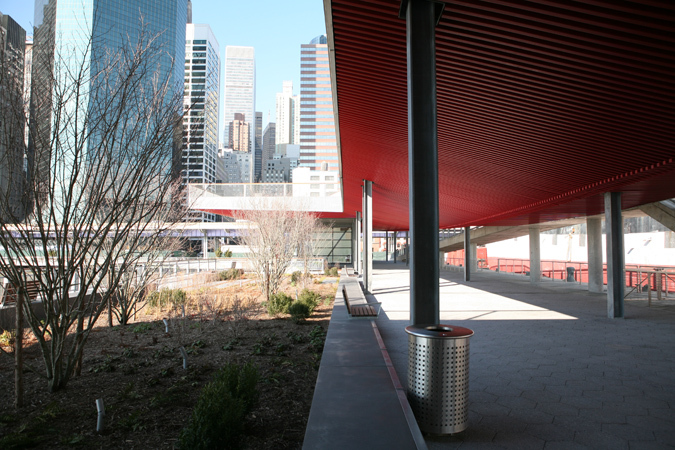 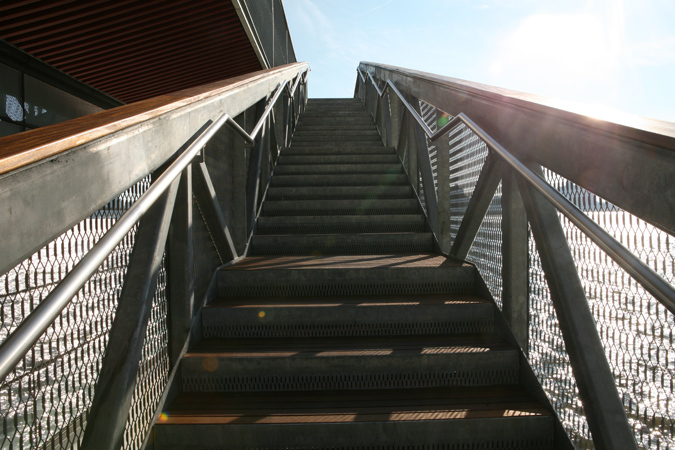 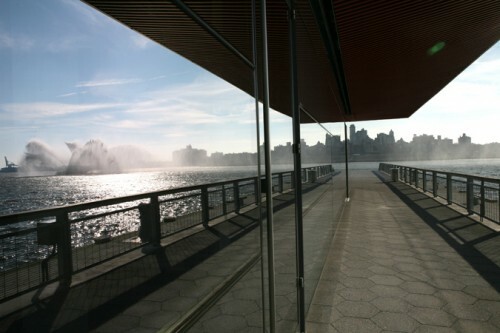 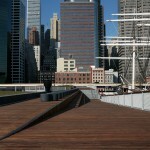 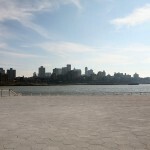 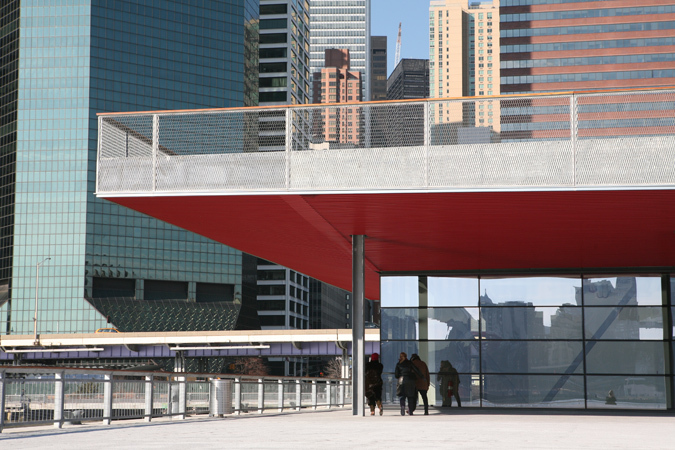 The pier adds 50,000 square feet of public space to the East River Waterfront Esplanade. 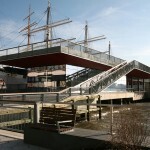 The project, a joint effort with City Planning, stretches from the Battery Park Maritime Building (the Governors Island ferry) to Pier 35, just north of the Brooklyn Bridge. 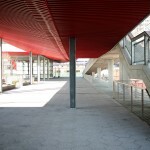 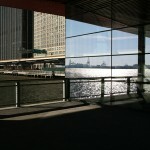 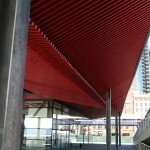 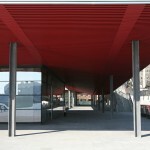 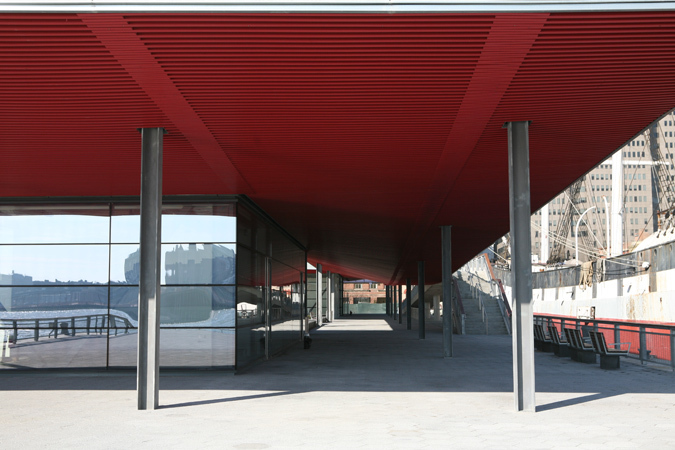 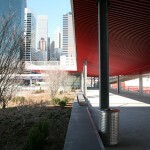 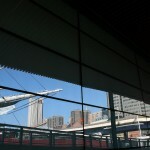 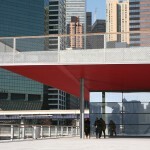 The lower level pavilion reflects a fire boat spouting water. 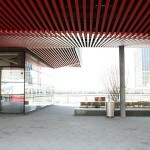 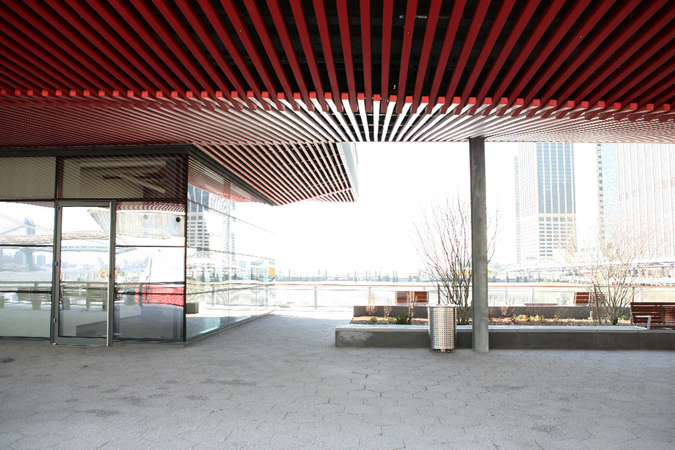 Of the two lower level pavilions, one will become a restaurant, to be run by the same company that operates as a smaller restaurant nearby in a pavilion on the East River Esplanade. 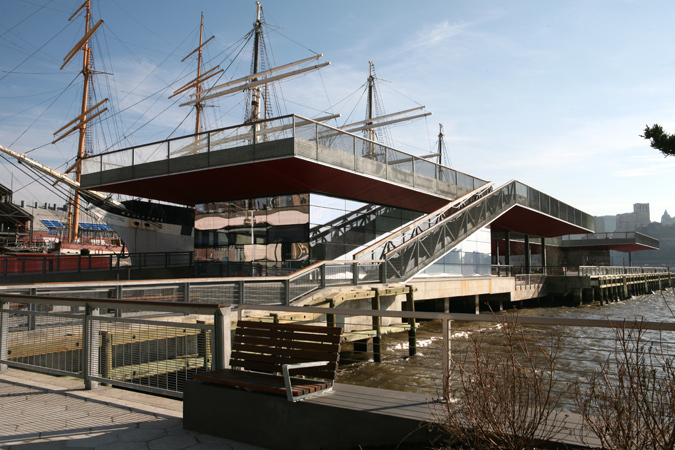 The second lower level pavilion will accommodate a maritime museum. 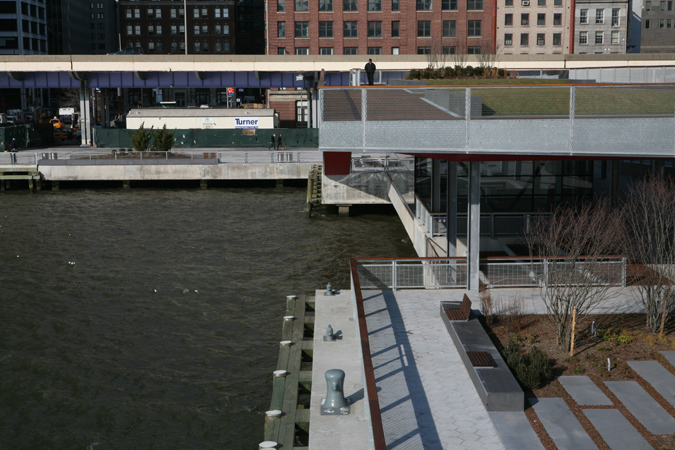 The RFP for the restaurant and marina have yet to be announced. 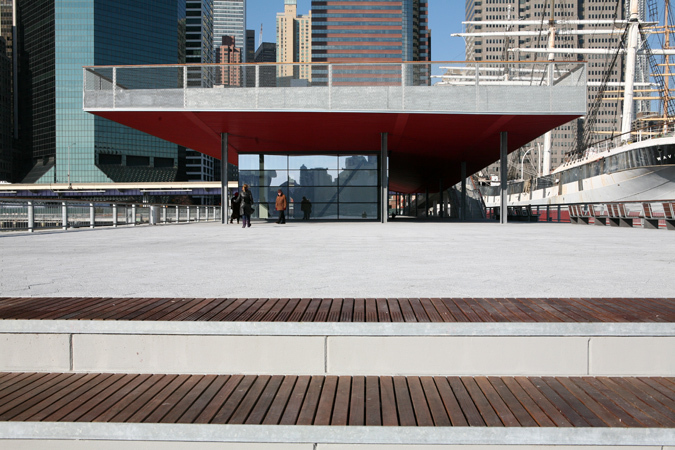 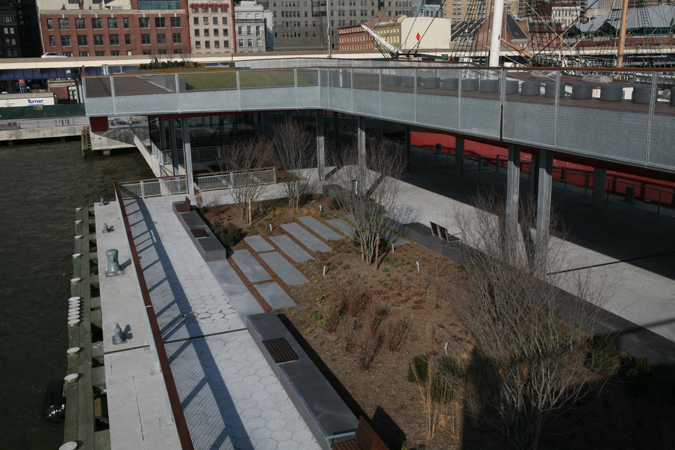 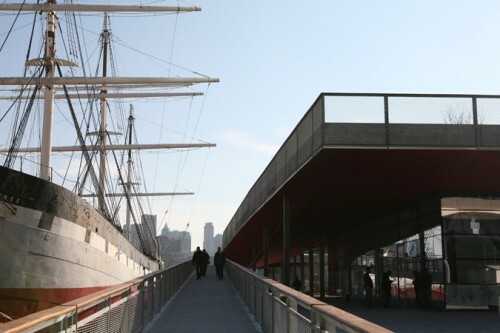 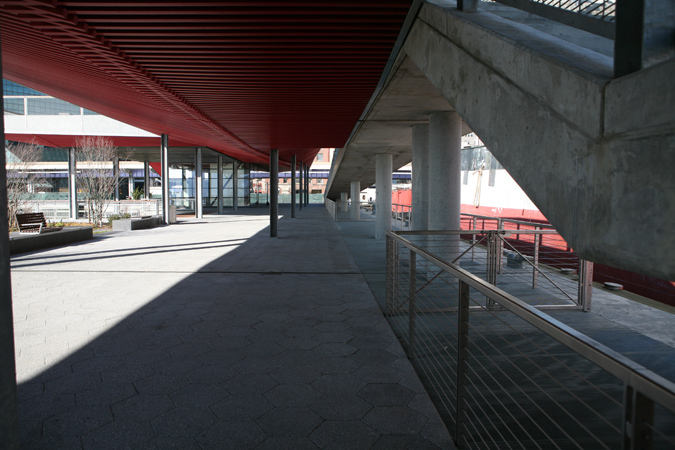 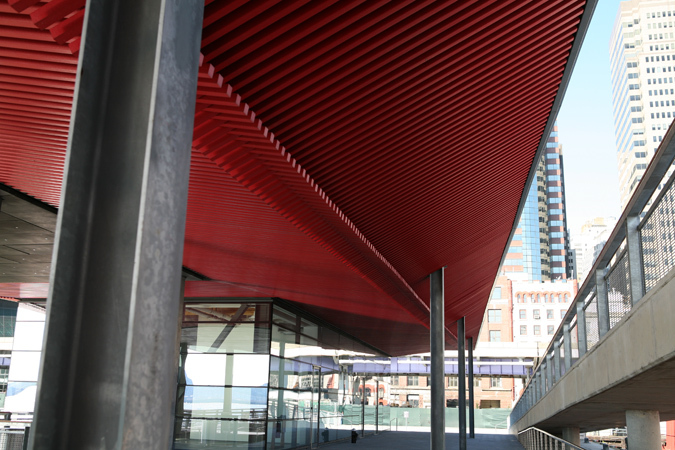 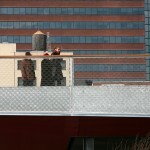 With the work complete, South Street Seaport’s Pier 17 appears all the more needy. 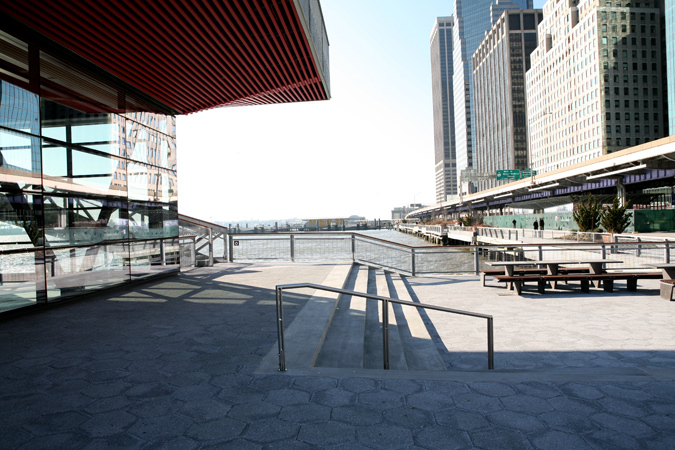 As AN‘s Eavesdrop column reported back in July, the city is still in the midst of negotiations with the Howard Hughes Corporation to revamp the dated pier/mall. 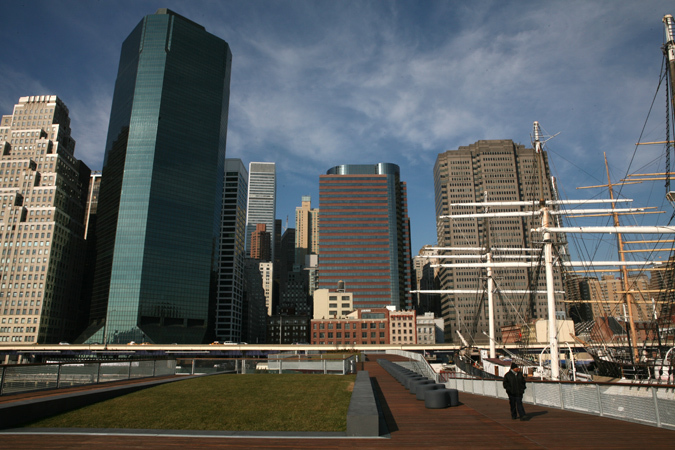 SHoP’s Gregg Pasquarelli recently told New York magazine that the firm relishes tackling the next stop north. 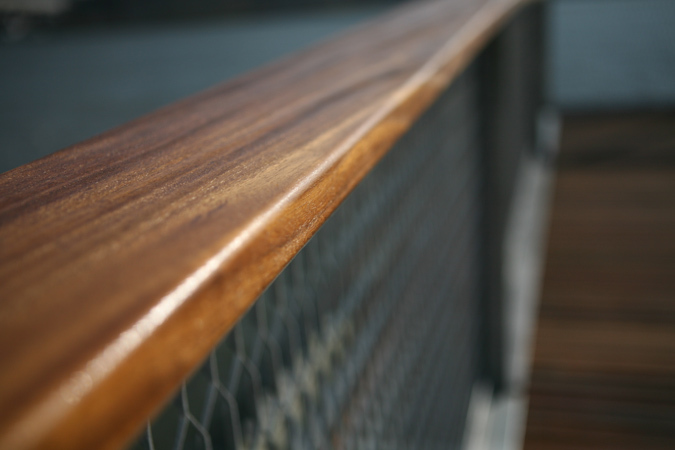 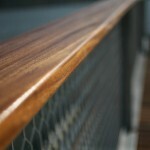 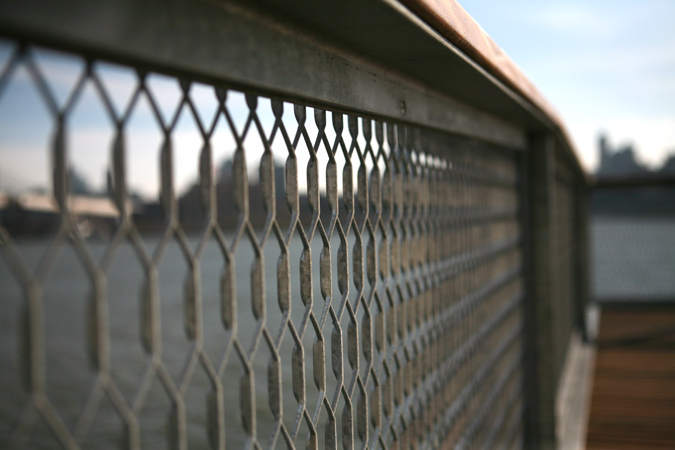 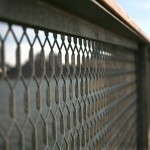 Crossed plastic slats beneath of the upper deck suggest the curve of a ship's hull. 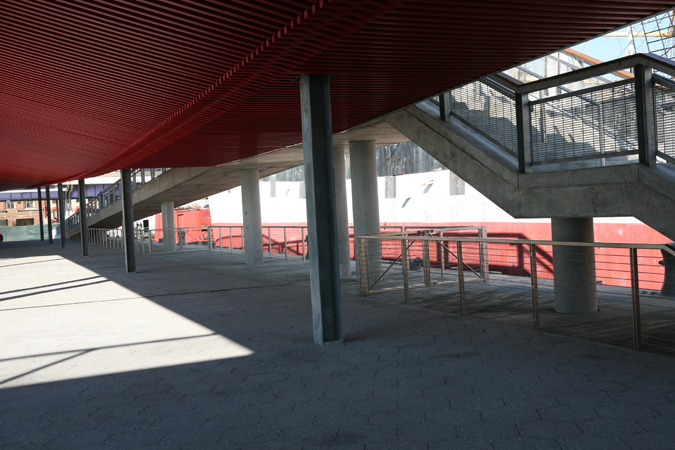 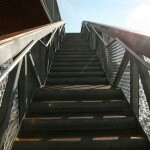 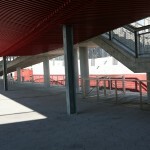 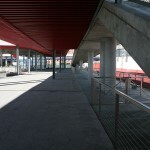 A long ramp leading to the upper level suggests a gang plank. 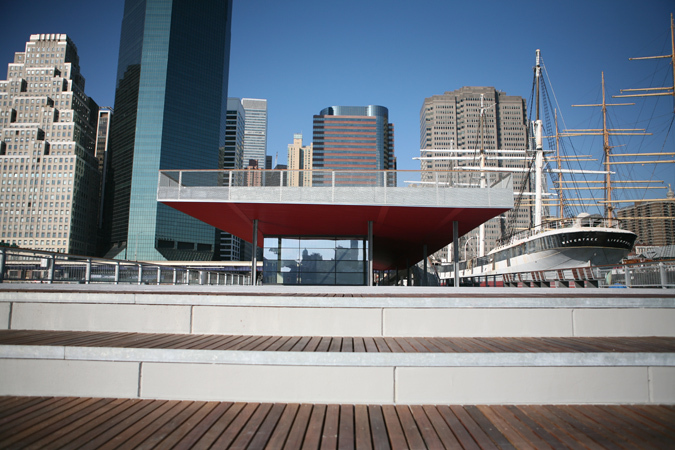 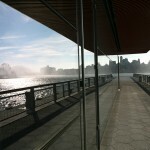 The lower level pavillion reflects a fire boat spouting water. 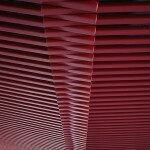 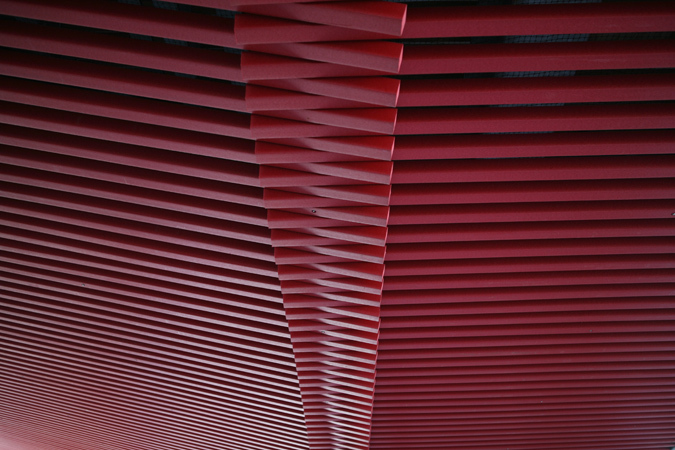 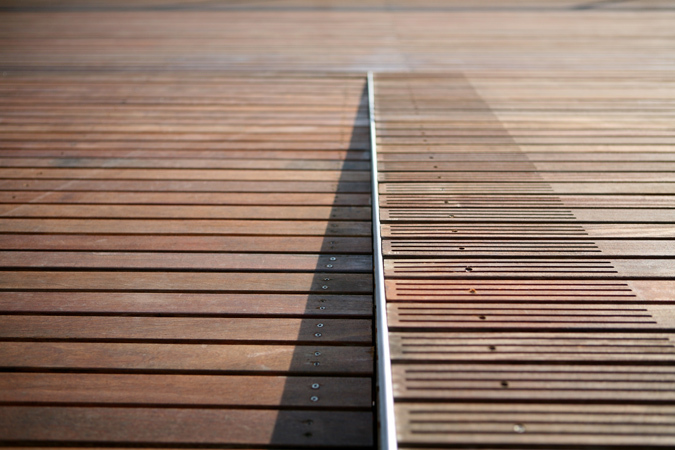 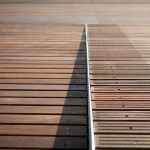 Crossed red wooden slats beneath of the upper deck suggest the curve of a ship’s hull. 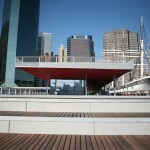 Three arched lawns grace the pier’s second level.